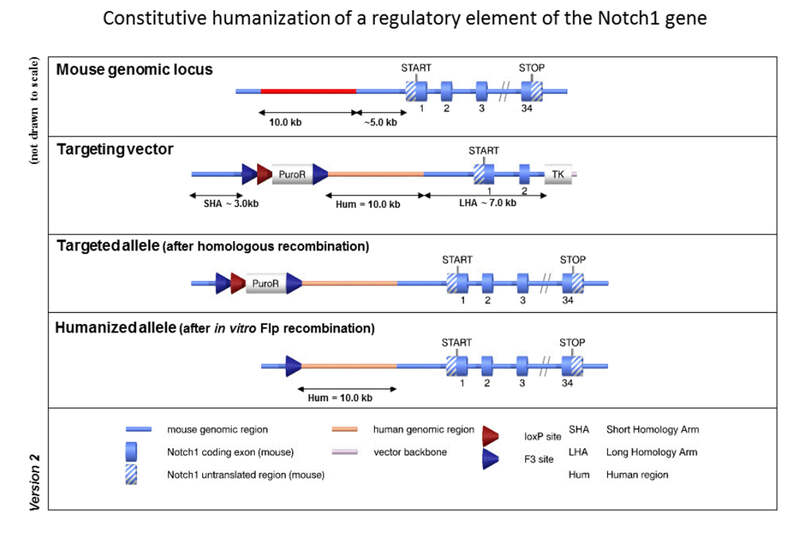 The targeting strategy allows the generation of a constitutive humanization of a regulatory element of the Notch1 gene. The targeting strategy is based on the NCBI transcripts NM_008714.3 (mouse) and NM_017617.3 (human). A 10 kb mouse genomic sequence located 5 kb upstream of exon 1 (position on chromosome 2: 26,508,823-26,518,822) will be replaced with its human counterpart (position on chromosome 9: 139,445,239-139,455,238). The positive selection marker (Puromycin resistance - PuroR) has been flanked by F3 sites and inserted upstream of the 10 kb region. This cassette also contains a loxP site. The humanized allele is obtained after in vitro Flp-mediated removal of the selection markers.